The third film in the Detective Dee series and a sequel to “Young Detective Dee: Rise of the Sea Dragon” (2013), “Detective Dee: The Four Heavenly Kings” sees our eponymous hero, Dee Renjie (Mark Chao) once again up again the formidable Empress Wu (Carina Lau) who is determined not to let anything or anyone get in the way of her ascension to power. Dee is entrusted with the Dragon Taming Mace by Emperor Gaozong which has the power to subdue any type of threat to national security, and Empress Wu needs to retrieve the mace in order that her machinations to take power are not revealed. Detective Dee’s first appearance was in an 18th century Chinese novel “The Four Strange Cases from the Era of Empress Wu” which was later translated by the writer Van Gulik who would go to create the “Judge Dee” story series. The fictional character was based upon Ti Jen-chieh, a medieval statesman, who is credited with persuading Empress Wu to restore the Tang House to power, making her exiled son Li Hsien, her successor in the process. Tales of Empress Wu’s reign (690-705), however, are less celebratory stressing her monstrous status as a murderer of children, who would go to extreme lengths to cement her place in history by eliminating all rivals even those with familial connections in increasingly grisly and gruesome ways. The exact facts are difficult to determine but all accounts agree that Empress Wu was one of China’s most important reformers and brought much needed stability to China after one of the most tumultuous times in its history. 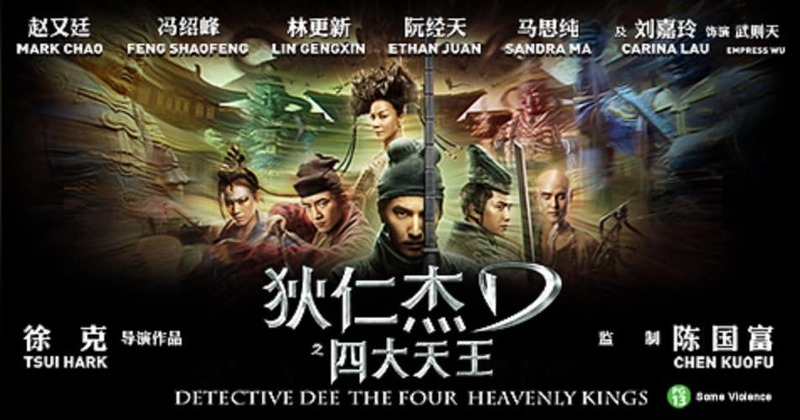 “Detective Dee: The Four Heavenly Kings” doesn’t deviate far from the historical script or the implicit gender politics of it: Emperor Gaozong is a largely ineffectual figurehead, with Empress Wu wielding the real power in the Imperial Court and only Detective Dee is capable of stopping her deadly behavior and deceitful ways. Having said this, as in many of Tsui’s films, it is women who hold the centre of the narrative and they are often the most fully rounded and empathetic characters. In fact, Detective Dee is fact on the periphery for most of his latest outing. The focus instead is on a group of illusionists and magicians called The Mystic Clan that Empress Wu hires to help Yuchi Zhenjin (Feng Sheofeng), Commander of the Golden Guard and Dee’s friend and associate, to retrieve. The group includes Huan Tian, Spectral Blades, Night Ghost, Smoke Volant and Water Moon (Ma Sichun). Water Moon is an interesting addition to the stock characters, providing romantic and comic relief through her developing relationship with Shatuo (Lin Gengxin), Dee’s friend and associate. While Dee is trying to keep the Mace safe from the Mystic Clan, a more dangerous threat arises in the form of The Wind Warriors led by the mysterious Faceless Lord, originally from India, who conspire with Empress Wu to overthrow the Emperor. The mystery that Dee has to solve here lies beneath the surface of numerous illusions including a painted golden Dragon on the Palace wall that comes to life breathing fire and seemingly killing those in its way; a multiple eyed gigantic monster; red tentacles that seem to have no point of origin and ninja warriors who transform into flying dragons. To reveal the truth, Dee – like Sherlock Holmes (his closest Western counterpart) – must draw on his powers of logic and reasoning in order to lift the veil of illusion. Like the other films in the Detective Dee series, the narrative is one in which apparently supernatural events and/or beings are revealed to be nothing more than optical illusions through the process of ratiocination. While it would be easy to criticise “Detective Dee: The Four Heavenly Kings” as not being narratively coherent – this seems to me to do a disservice both to the film and the director. Even given the fact that it does take time to get going, the carefully choreographed action sequences and their imaginative construction makes the third film in the Detective Dee series the most spectacular and affectively riveting. At the end of the day, action cinema is something that needs to be felt and experienced rather than thought and “Detective Dee: The Four Heavenly Kings” draws us into its magical world and doesn’t relinquish its grip on us until its over. Fantasia Interview with Tadashi Nagayama: I’m inspired from uneasiness and anger in daily life.